BJJ rash guards are staples in the arts. The benefits vary when wearing a rash guard under your Gi. Some of the benefits include preventing injury due to muscle compression, reduce the spread of bacteria, wick away moisture, and preventing mat burn. There are many studies that can backup how wearing a rash guard can speed up the recovery process because of the compression of muscles. Rash guards may also reduce the occurrence of smaller injuries as well. While wearing the Gi it is common to open it in order to destabilize your opponent and more. When this is opened it can expose more than 30% of your skin allowing a big surface for bacteria to attach to if you are not wear a rash guard. The more one is rolling on the ground the more sweat that is accumulated and with a rash guard wicking away sweat it can help to alleviate the sweat transfer. Lastly the original purpose the rash guards were invented was to help avoid rashes and mat burns. The friction that happens on the mat can cause long lasting scars. Due to the rash guard being smoother than your skin it can displace the friction from the mat. Clearly there are many reasons that having a BJJ rash guard can help any practitioner through a match or training. Rash guards are an absolutely necessity for all practitioners, including bjj guards for women and kids. Luckily you do not have to look much further because Viking Gear has exactly what you need when you need even. Berserkers were a group of special elite Viking warriors who went to battle without traditional armor so why go with the average cheap bjj rash guards most everyday joes use? Do not worry we have the Berserker Rash Guard. Lately, these rash guards have been flying out the doors at our gyms so it has been about time that we have them online. This specific type of Rash Guard has been sold out for a while so when we have them it is important to get them while they are fresh on the market. This rash guard is stitched together with the Viking Gear reinforced stitching. This allows it to be fit and comfortable. The blend of materials makes it able to be used as a thermos-regulated outwear. The Berserker Rash Guard is a cool rash guards bjj that even cools you down when you are hot and keeps heat in as well. Like all top quality rash guards, this one is made with the special printing process that will keep an everlasting print for all your battles! You can also wear this under your Gi. Although this is not exactly made of Asgardian Steel and inscribed with the sacred Runes of Odin, this is still one of the top rash guard that is made for the best protection for your upper body on your conquest! This popular rash guard is made with Viking Gear reinforced stitching methods that create some of the best material for any fighter. This gear is both flexible and comfortable.At the same time, it is similar to the Berserker Rash Guard because of its use as a thermo-regulated outwear. It is also made with the special printing keeping your reminder of Thor’s Armor protection forever on your shirt. This is great for no gi rolling or simply wearing under your gi. Get this extremely popular rash guard as soon as possible! Only the boldest and bravest warriors are selected by The Valkyrie to go to battle, will you be one of them? Well, first you will need to decide which Valkyrie rash guard you will have. 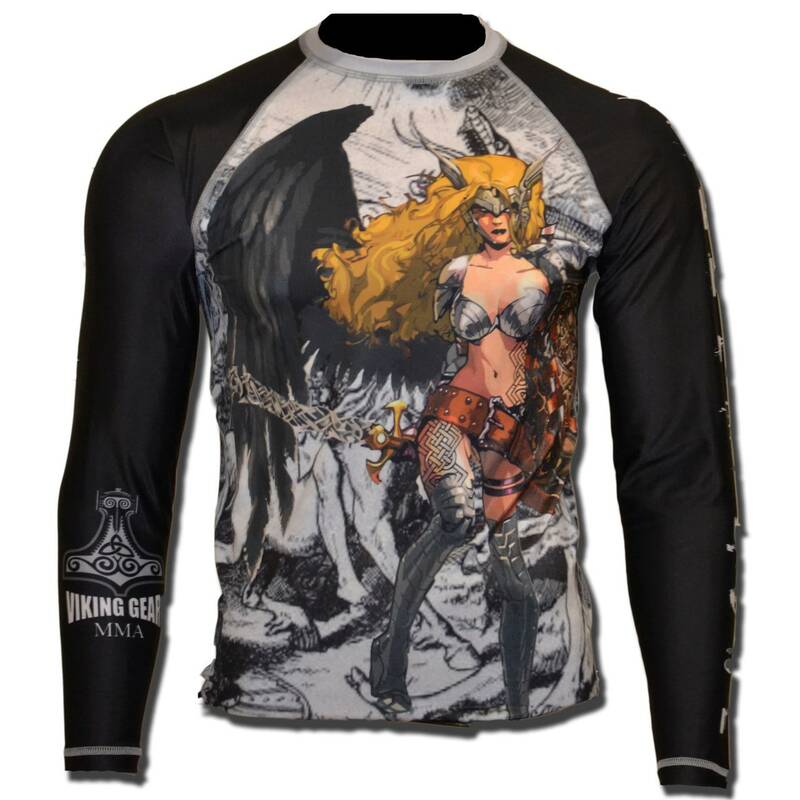 At Viking Gear we have three different selections of Valkyrie rash guards; Valkyrie Chain Rash Guard, Valkyrie Odin’s Mark Rash Guard, and Valkyrie Ragnarok. Each piece has been beautifully designed with intricate designs and print all in the name of Valkyrie. All of them have been in high demand so get them while they are hot. Designed with Viking Gear reinforced stitching methods to create comfort and flexibility. Every Valkyrie piece can be used as a thermos- regulated outwear. This means they all help keep heat in as well as keeping a warrior cool when in hot situations. The intricate designs are made to never fade or lose it’s crisp look. 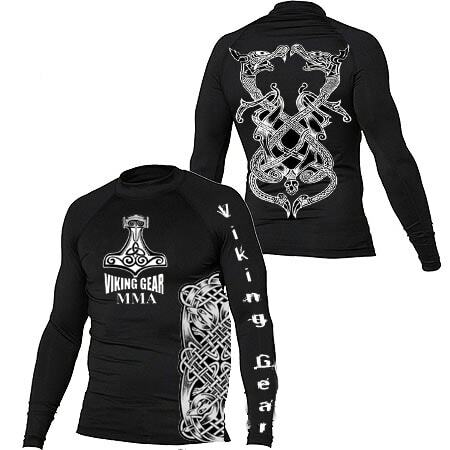 All Valkyrie rash guards come with a one-year VikingTough Warranty, making it a win-win deal! 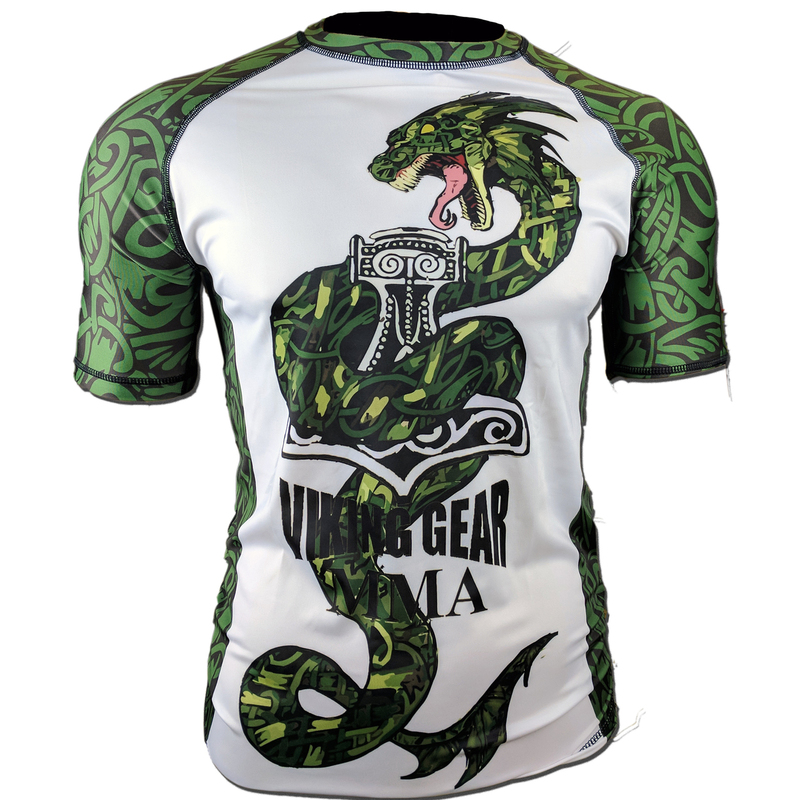 Be as tough as the Jörmungandr in one of our Midgard Serpent Rash Guards. Jörmungandr, the Midgard Serpent, is known as a child of the Norse God of mischief and trickery, Loki. The Midgard Serpent was sent away by Odin into the ocean. That is where she grew so big that even with her tail in her mouth she surrounded the whole entire world. With the churnings of her coils, she created tsunamis and tempests that drowned many sailors. When she releases her tail Ragnarök, the great battle will begin. There are three different types of Midgard Serpent Rash Guards including the Midgard Serpent Classic, Midgard Serpent Black, and Midgard Serpent White. Each one is designed with a special printing process that will allow a long lasting and never fading design no matter how treturous of battle you may encounter. They are all also made with the strongest most durable Viking Gear reinforced stitching method. They are breathable, fit and comfortable no matter what size of Viking you may be. This is also made out of material used as a thermos-regulated outwear. Keeps heat in and keeps you cool as well. Like Fenrir, you can not be held by any bond! 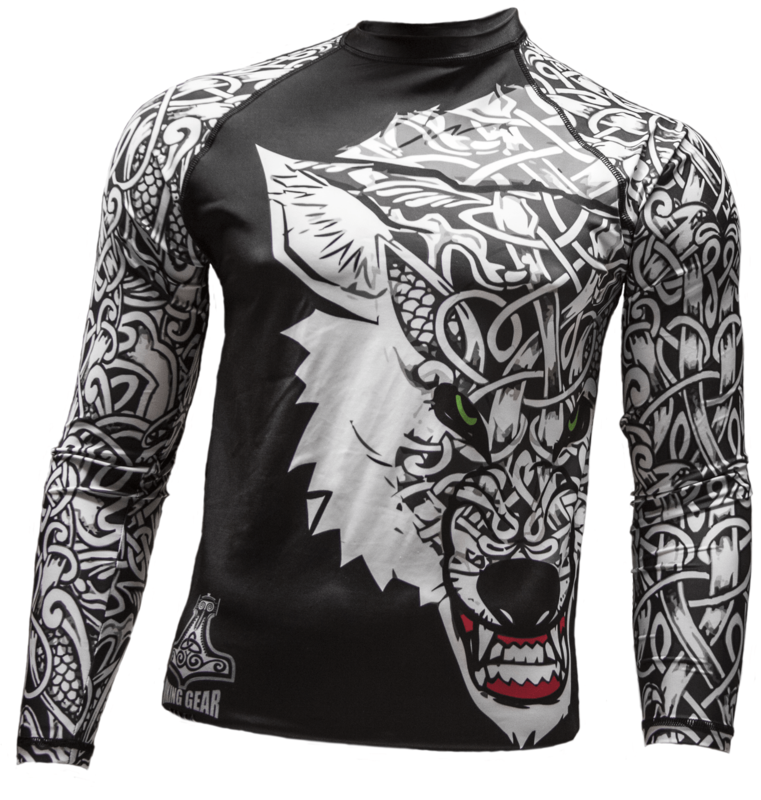 Fenrir a fierce and ferocious wolf is what is portrayed on both of our Viking Gear BJJ rash guards. WIth these rash guards, you can be the God Slayer, feel confident and comfortable. We now have Fenrir God Slayer Rash Guard and the Fenrir God Slayer Rash Guard Grey suitable for any type of fighter! The detailed piece of art is available for all but going fast! The reason being that it is made with some of the strongest material known in the industry, with the Viking Gear, reinforced stitching method it is strong, reliable, and flexible. This means that this BJJ rash guard will not be getting messed up only after a couple rolls but will continue to stay maintained for outwear. These guards are a nice clean looking design that makes a statement while settling enough to wear under your gi! Fenrir Rash Guards are also used as a thermos-regulated material retaining heat and keep a fighter cool as well. Get them while they are in stock.